More of the same this week. Tuesday night I was able to knock out a really good set of intervals down a Hyland. I felt great and was able to really push the envelope. I was hopeful that it was a sign of good results coming. Thursday I got out on the lake for the first time this year. It was mostly just to get some activity in. There was some skating in the powder and some double poling in the snowmobile tracks. It looked like it was going to be cold overnight Thursday and Friday. The fresh snow that Winterpark received on Monday/Tuesday was reported to be groomed in nightly and setting up very firm. 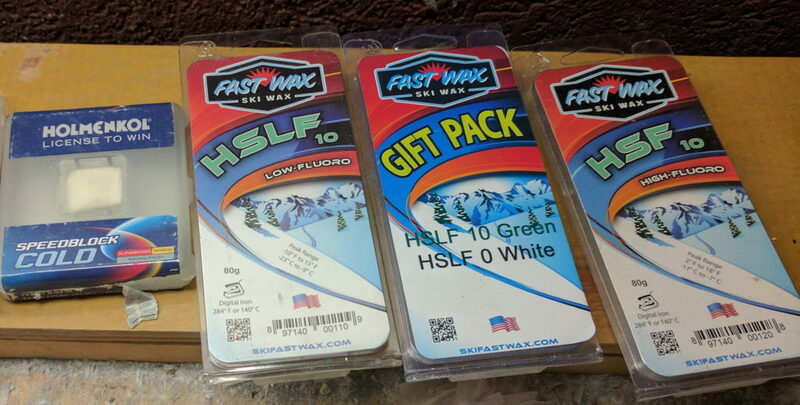 I opted to go with my cold hardpack Rossignols with my old standby of FastWax followed by crayoning on and then ironing the Holmenkol Speedblock Cold. My skis felt competitive. There seemed to be equal amounts of skiing up on people and having people ski up on me while we skied in a group for most of the race. I certainly wasn’t outrunning anyone, but at the same time I wasn’t having to skate downhill to keep up. It was a little cool at the start of the race with the temps still in the single digits. There wasn’t any real wind though so it didn’t feel too bad. The trails were in phenomenal shape. The best skiing of the year so far by far. 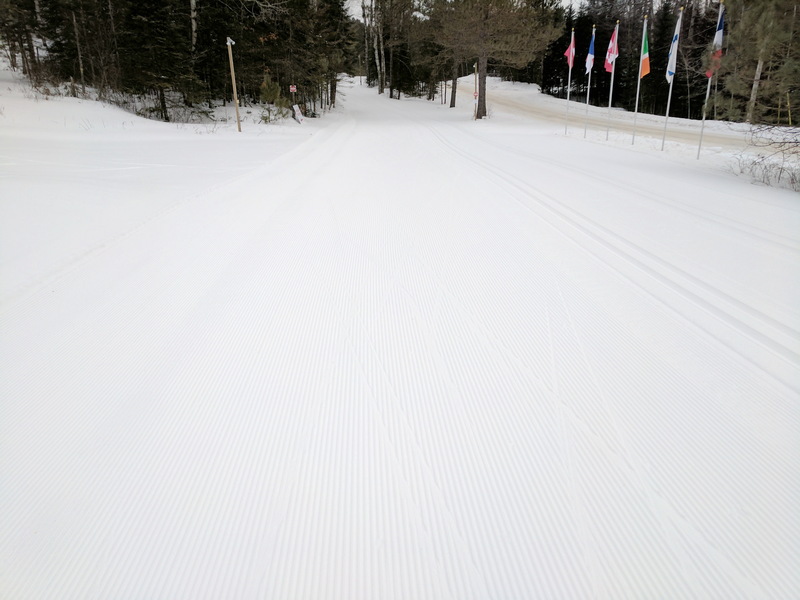 Wide, firm, perfect corduroy. If the snow had been about 10 degrees warmer that would have been perfection. As it was, there was just a tad bit of squeak to the snow indicating it wasn’t as fast as you might hope. Hard to see in the flat light conditions, but that curodory is perfect and the track is rock hard. The start area is pretty narrow only being about 6 lanes wide. 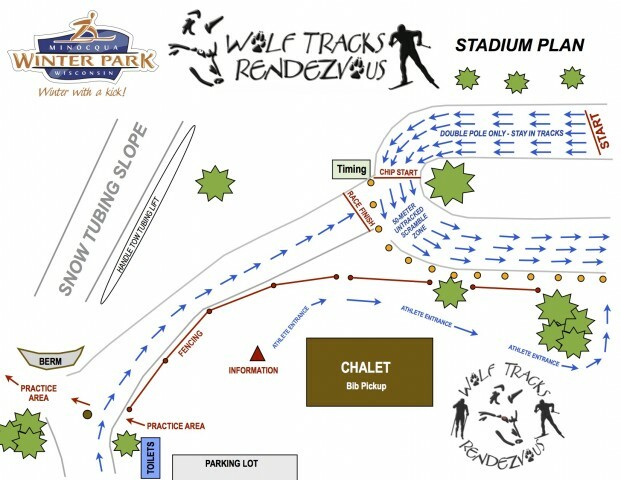 After a whole 50m or so, the course takes a 180 degree left hand turn before heading out onto the trails. By the time I got to the line my choices were the far right front line, or the second row. I opted for inside lane on the far left in the second row. We made it out cleaning by some miracle and we were off to the races. The first 10k of the race are pretty hilly and fairly technical. 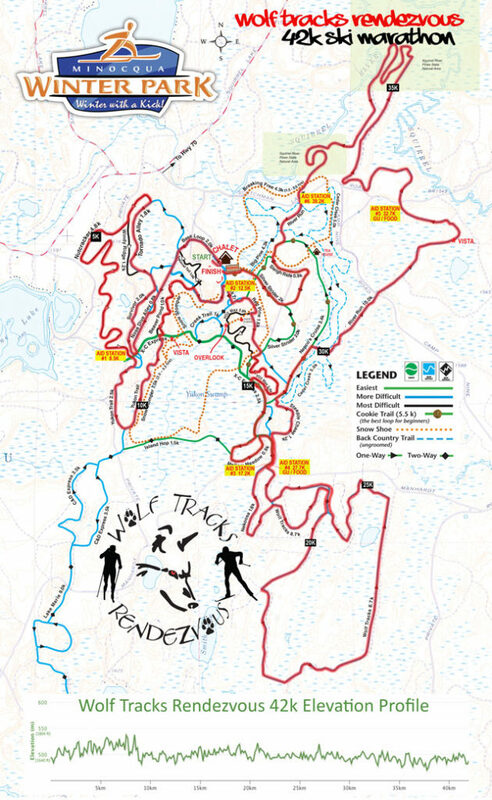 It was compared to the Silver Trail at Giants Ridge before the race and afterwards I would say that is the best comparison I could make. The hills can be burly, but they are never too long. It definitely goes up and down a lot though. Some of the downhills can be a little hairy. The snow was good and I was towards the front so they weren’t a problem for me. I could see them being pretty scary if it were icy though. For the first 2km or so I fell in line behind TK. He became concerned that the guy in front of him was letting gaps open and finally made an effort to go around. He looked to me like he was scrambling to close the opening gap and I knew I was already on the limit so there was no way I was chasing him down and let him go. He and the lead pack slowly disappeared around the bends in the next kilometer or so before I never saw them again. In the mean time I fell in with a group of 4 guys and we continued to charge the hills at what for me was a pace I wasn’t sure was sustainable. Right around the first aid station I finally had to let two of the group of four go. The fourth had trailed off a little behind us. Starting at about 2km in, where the real climbing had started, I was averaging a HR of above 175. That’s pretty hot for me and definitely not sustainable for 42km. Interestingly enough, this was a few kilometers further, and a bit hotter than the week before at the Noque and it didn’t feel as bad. I still knew it was time to reevaluate though. 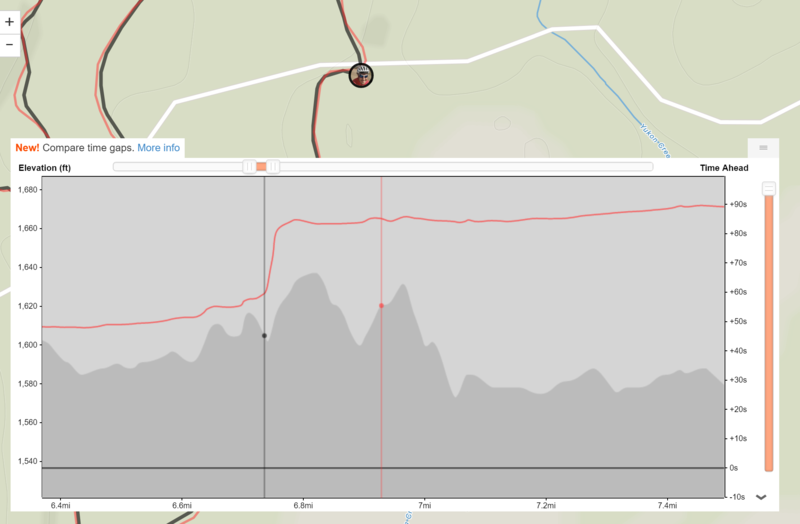 HR and elevation profile from 2km to roughly aid station 1. From there I fell in with the fourth member of our previous quartet, Jay Creagh. We agreed the other group was going a little too fast for us. We then made a wrong turn about 2km later. Had I paid attention better at the start I would have heard the instructions to follow the blue arrows (matches the blue bibs), but I didn’t. I clearly saw both arrows but didn’t know which way to go. Thankfully the ski patrol at the previous corner saw our mistake and shouted us back onto the right course. All told we probably lost about 30 seconds in the detour. A volunteer stationed at the corner would have been nice… but a racer should be responsible for knowing how to follow the course markings too. Strava Flyby comparison with Scott Golomski showing the effect of missing the turn. Something on the order of 20-30 seconds. After the mishap Jay and I continued on to the next aid station and some more climbing. At that point I thought we were pretty much alone only to turn around and find Artie and Gary breathing down our backs. I’d been beating Artie with a fair margin previously this year so I was pretty surprised to find him right behind me. At the time I figured I was working right about at my limits so maybe he was just going too hard too early. It was a thought anyhow. For the next 28km we had a solid group of 4 with Artie, Gary, Jay, and myself. I think Jay probably did about 50% of the pulling. I maybe did 10% to 20% with Artie taking up the rest. I was just on my limit for the most part and didn’t feel I could put a solid effort in at the front. Part of the problem was that every time someone new went to the front they pulled through instead of letting the person previously on the front fall back. I came to dread seeing a lead change since that usually mean a minute or two of increased effort. This whole stretch I really felt like I was racing well. I was in a good group, using the draft as best I could. I did try to take my turns when presented. At the same time I felt like I was riding that fine line between going hard enough without blowing up. Every time a little surge happened I could feel my body responding with fatigue. My nutrition strategy wasn’t ideal for the race. Normally I try to use liquid nutrition, but I forgot to restock before the race. Instead I stuffed two gels in my drink belt zipper pocket (forgot the staples or safety pins too). I did manage to eat probably 2/3rds of each one. The first around 15km, the second around 3okm (I think, it might have been more like 35km). After one of those I had drifted off the back of the pack trying to situate everything and stick the wrapper back in my pocket (I hate littering the trail, I’ll only drop a wrapper if it is right in the aid station). That forced me to make a little push to catch up which would not be ideal. With about 6km to go, Gary made a move to try and break our little group up. I had been thinking about when I should try and make a move, but was definitely waiting until much closer to the finish. As it was, I didn’t have much to respond to the attack. Artie did though and he closed the gap down and Gary settled back in again. After the final aid station with about 2.5km to go Artie went to the front and the pace picked up again. This time it kept going though. On the previous little climb I felt the telltale signs of a bonk coming on. I’ve felt it in the Birkie before where my eyes go a little buggy and I almost start to get tunnel vision. So when Artie ratcheted up the pressure I didn’t have enough to respond. Over the final two kilometers Artie and Gary were able to put 30 seconds into me. I wasn’t in full on bonk mode though as I was still able to elevate my heart rate, but I was just too fatigued to find that next gear. Thankfully for me, after doing all of that pulling, Jay was also spent and drifted back from me. I ended up 13th overall in a time of 2:17:00. Originally they stated the age groups were 5 year increments and I thought I had won the 35-39. Unfortunately they changed it to 10 years and I was 7th in the 30-39. Artie crushed it taking 11th 31 seconds ahead of me with Gary just one second back. So much for thinking Artie was going too hard too early. Jay drifted 17 seconds behind me. Tommy also had a killer race finishing 5th overall over 8 minutes ahead of me. So much for thinking he was scrambling in the opening kilometers. As I said in the middle of my report, I thought I was racing really well. Despite my placing relative to other people, I felt that I was riding that limit of what I could do in a marathon. The bonky feeling at the end seems to support that (and a need to work on nutrition). I wouldn’t mind getting those 30 seconds from the wrong turn back, but ultimately I don’t think they made a huge impact on the race. The spreadsheet is going the wrong way. 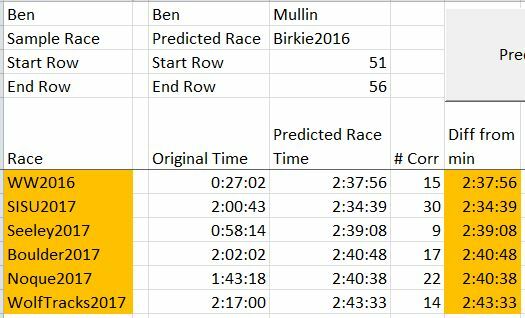 Each race seems to indicate a less great equivalent 2016 Birkie. This was the longest race of the year. I’m not sure if my relative performance at the longer distances isn’t as good. That is certainly one possibility. This felt like a pretty good effort though. 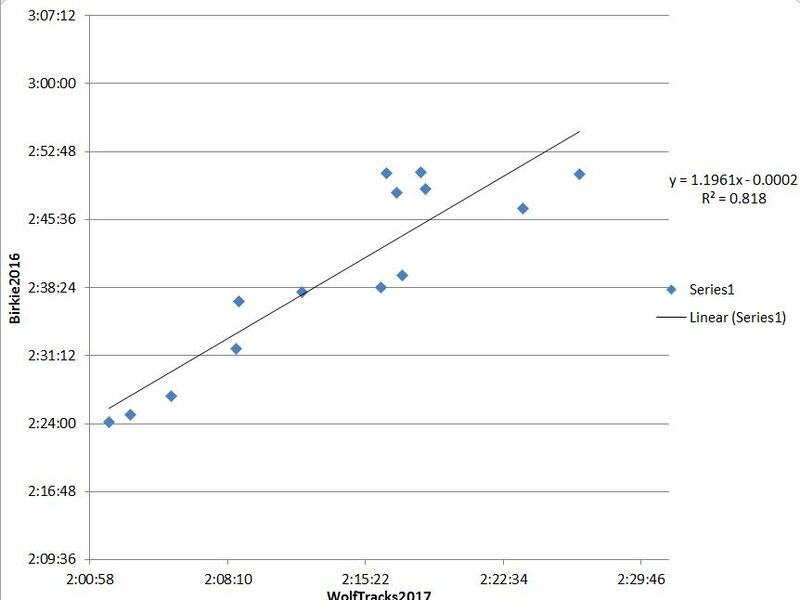 The cluster of four point above the line is a group of us that had better relative performances at Wolf Tracks than the Birkie. Artie is in that group as well. Collectively we pull that trend line up making the correlation less good. Still going to have to wait and see what the actual race results are I guess. I’m still deciding. I’d like to do Mora, even though it is not the point-to-point race this year. I’m still stalling a bit to see how well the course shakes out. I liked the course last year, the icy conditions were less ideal and I’m hoping to see reports that the course is good. A little real snow wouldn’t hurt either. If not Mora, I’ll probably do the PreBirkie. I’ve got to arrange some things though in order to go to Hayward for the day on Saturday.